Leopold's Crate: Running with Leo and Halo: the perfect running buddy sometimes takes time and training! 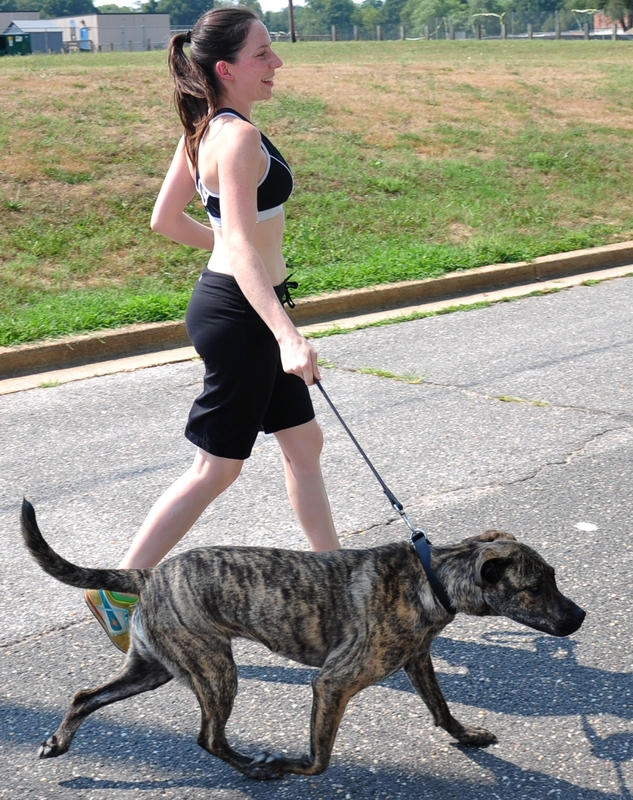 Running with Leo and Halo: the perfect running buddy sometimes takes time and training! I love running with my dogs! I love that I get to have some company, the dogs get to be out of the house and move at a pace more to their liking, and we all get exercise. Both Leopold and Halo love to run and are wonderful running buddies. However, running with my dogs did not start out being an enjoyable experience. The first time I tried running with Leopold, I discovered the experience was not as amazing as I originally imagined it’d be. Leopold wanted sniff at things and so would suddenly stop, nearly yanking my arm out of its socket, to put his nose to a particularly interesting smell. I also had trouble getting him to run past other dogs without trying desperately to stop and play. Leopold also seemed to have a low tolerance for being tired. Or bored. I could never tell. If he decided he’d had enough, he would stop dead and lay down in the grass. During one run, we were more than a mile from home when Leopold decided he was done with running and wanted to instead lie down in the grass. We turned around right away and headed back, but he continued to lay down in the grass every few minute or so the entire way home. Passer-bys found this to be quite funny and in retrospect, I suppose it is. At the time I found it to be very frustrating (stubborn dog!) and was a little worried (maybe he’s over-heated??). Over time, however, Leopold has become a much better running companion. He now only stops when he has to do his business, which is perfectly fine. And I’ve learned that I can’t run with Leopold on warmer days because he doesn’t get far before the grass looks more inviting than does the run. My experience with Halo as a running partner has been, quite literally, a more painful one. When I first started trying to run with her, she ran like a crazy dog: Halo would weave all over the place and would incessantly pull me to go faster. I tried to get her to run by my side, but was having difficulty getting her to understand. But persistence paid off with Leopold, so I kept making an effort with Halo. At the time I was trying out a new running technique commonly called “bare-foot running”, and was wearing toe-shoes during my runs. During one run, Halo was weaving more than usual, and ended up tripping me a couple times, almost making me fall. This was irritating, but the cherry on top of this awful run was when she ran in front of me and I accidentally kicked her leg in such a way that her entire leg smashed between my toes, snapping my pinky toe out. I slowly hobbled home, each step sending a shot of pain through my foot. (Who knew such a little toe could hurt so much?) And if the cherry is the broken pinky toe, then the whipped cream was when Halo accidentally stomped on my broken toe as I was trying to get her into her crate back at the house. I stopped running with Halo after this incident. Partially because I stopped running for a while to let my toe heel, but also because I decided Halo was too unruly of a running partner. It was suggested by Halo’s pet training instructor that first she learn to walk nicely and then we could work on running. Chris and I spent a lot of time working with Halo and teaching her how to walk well on a leash. The next time I tried running with her, she was the perfect running buddy! I’ve come to learn that successfully running with a dog doesn’t always just happen right away. Dogs aren’t naturally inclined to run directly at your side, suppressing the desire to stop and sniff everything and everyone. It was worth the time and effort to teach my dogs how to run with me though, as we now all benefit from the experience of running together.